It was the very last day of his freshman year when Andrew Lee ’18 ended up in the emergency room at Wentworth-Douglass Hospital in Dover in May 2015, sure he was suffering from appendicitis. A week and a transfer to Massachusetts General Hospital later, he had a very different diagnosis: hereditary leiomyomatosis and renal cell cancer (HLRCC), an extremely rare and incurable form of kidney cancer. Lee was quickly enrolled in an experimental treatment program through the National Institutes of Health, not far from his Maryland home, and his father soon sat him down for a serious conversation: if his time was limited, what did Andrew want to accomplish with his life? “I said I wanted to own my dream car, a Nissan GTR,” Lee recalls. He was joking — sort of — but his father was not, and enlisted his local Nissan dealership to track down the luxury sports car, which drew a lot of attention wherever Lee went. “Once I started sharing my story, I realized I could actually use the car to raise awareness about not only my own cancer, but rare kidney cancers in general,” he says. After a few modifications, including a custom orange paint job (orange is the color for kidney cancer awareness) and a defiant F CANCR vanity plate, Lee began driving to car shows, where he set up a booth to share information and accept donations for kidney cancer research. Lee returned to UNH last August to start his sophomore year, juggling a full business management course load and weekend trips home for treatment. When that proved too taxing, this spring, he worked with Paul College associate professor of strategic management and entrepreneurship Andrew Earle on an independent study to formalize his fundraising efforts into a charity called Driven to Cure. Working with Earle, Lee developed a business plan, built a website and filed the tax paperwork necessary to incorporate as a not-for-profit organization. To date, Driven to Cure has raised some $100,000 for kidney cancer research — and provided a tremendous outlet for Lee. 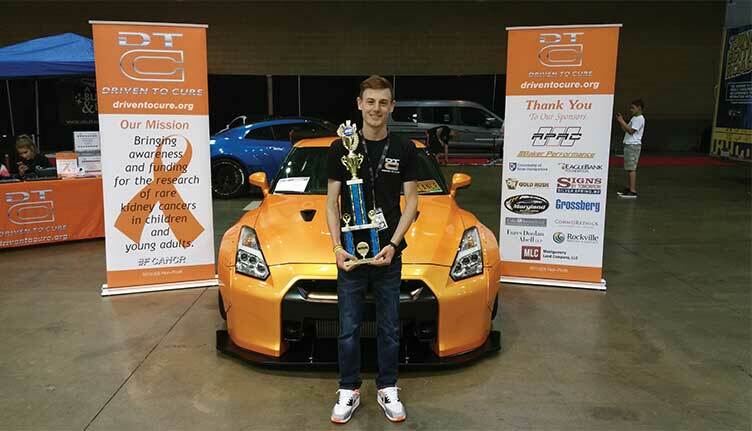 “My GTR has proven to be the closest thing I have to a cure for my cancer,” he says. Andrew, Tommy, Sarah and Bruce Lee, we love them all, and are impressed beyond description how they have used unwelcome adversity as a springboard to help others. The article touches on what remarkable people they are, and we are proud to be their friends.